Happy Tuesday, blog friends! Welcome to the second day of the Lil' Inker Design January release. I apologize about my day 1 post not being up on time...I had it scheduled on the wrong date. Sheesh...I had a long weekend. Lol! If you missed it yesterday, just keep on scrolling after you read this post so you don't miss it! For the first time ever, I cut all the papers just freehand with a pair of scissors. I love the uneven & imperfect lines it gives all the paper layers!! Be sure to check out what all the other designers have created as well! I will be back tomorrow with another project using some of the new products! Be sure to like the Lea Lawson Creates Facebook page to easily keep up with my crafty creation, & become a follower of my blog in the right sidebar. :) Have a great Tuesday! 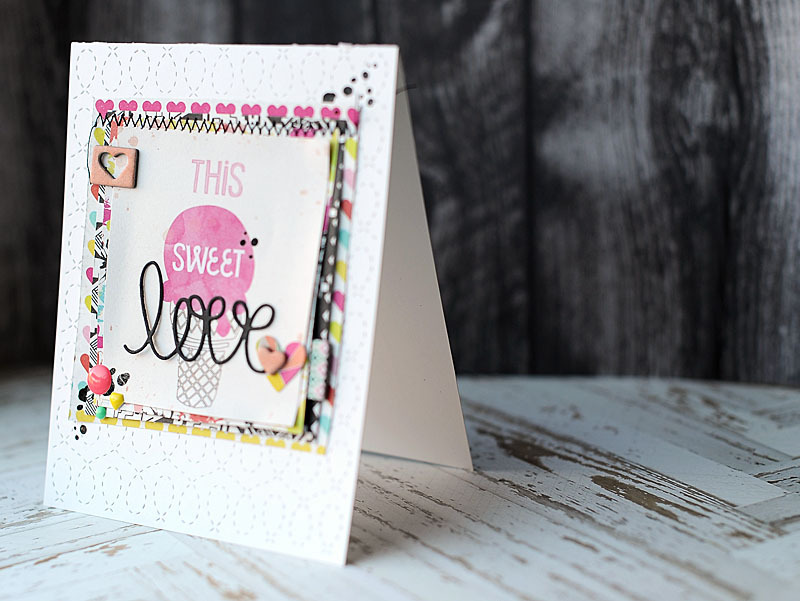 LOVE your stitched swirls, LOVE your doodled "love" - they look perfect together!!! LOVE your CHEERY layers too!!! Very nice layered card ! Mmmmm! THIS is soooo sweet! The love die cut word pops in black. Very nice! Love the layers! So so so pretty!!! Wow! LOOOOOVE those colors. And the stitching! And the freehand cuts and just all of the layers!! Wow! I could look at this card all day!! 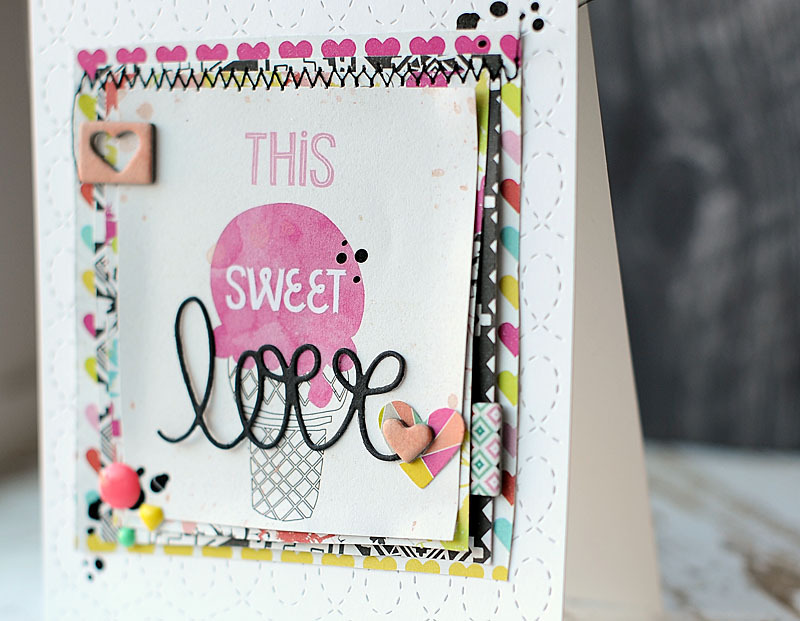 Super cute, loving all those layers, so much to look at on this card! Such a sweet card! The layers and stitching are beautiful! So sweet with the quilted background, the ice cream cone and the love die. LOVE your card -- such a fun design, great colors and those pattern papers are to die for! Super cute card! Way to cut without the cutting blade! I can't get myself to do that; however, your card is absolutely beautiful! Perfectly imperfect! Super, super card! 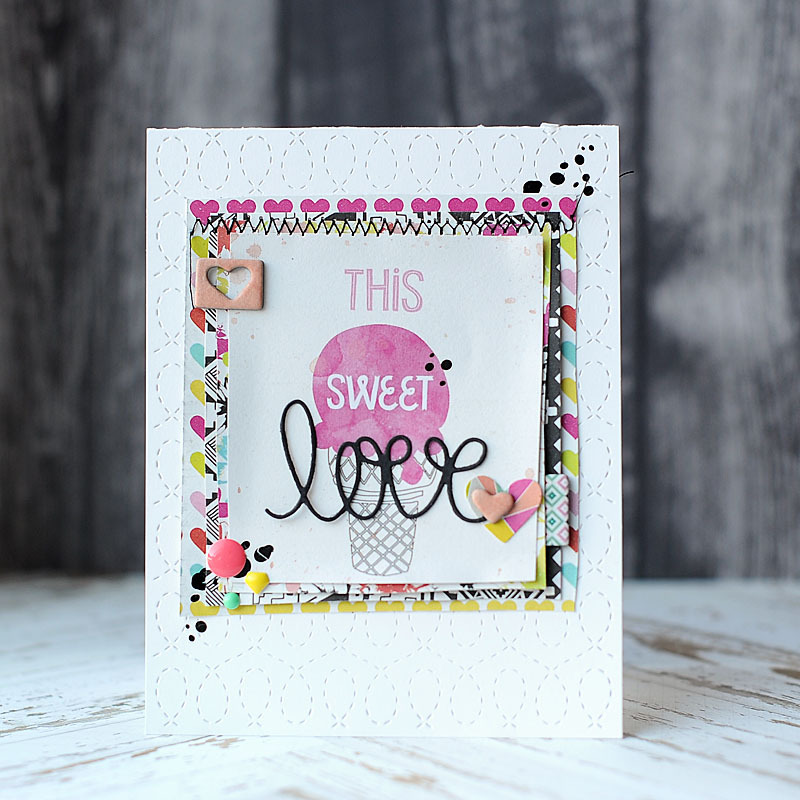 Love the layers and die cut along with the sweet image. This new die is so pretty and creates a beautiful background! I like your colorful layers of paper. I don't think anybody would notice that the cuts aren't straight if you hadn't mentioned it. Love the new die. Your card is just beautiful! I love all the layers and that stitched background just sets it off perfectly. Great work! liked your color scheme and design - great job! Love the design of this card and all the elements on it, absolutely love that quilted background! Love all your layers! Fun card. this collection looks fabulous because of you! Love how you layered the elements! Totally FAB! So glad that you join the fun over Simon Says Stamp Wednesday “Something New” Challenge! Love the PP with the new dies, the texture in the layers is fabulous! Great layering and textures! Love the new stamps and dies! love the texture on the background and the mix of pattern bits! SOOO yummy :) Thank you for playing along with us at Simon Says Stamp! Very pretty layering of patterns and love the simplicity. Such a lovely and sweet card! Oh I love every detail on it! 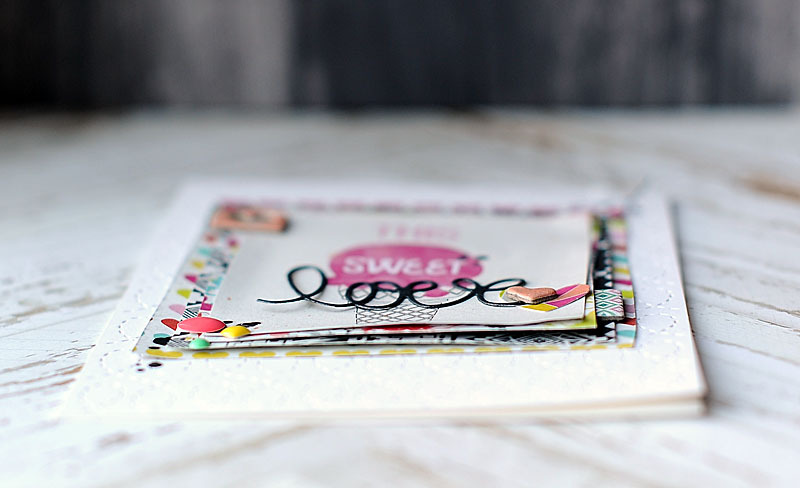 Goodness, your sweet card, looks good enough to eat...all those cute little added elements...love it! Such great layering and colors!